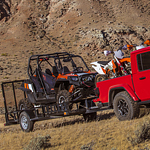 Jeep Gladiator: New for 2020 | Bud's Chrysler-Dodge-Jeep, Inc.
With the 2020 Jeep Gladiator, the brand is expanding its range of offerings. The Gladiator, which will soon be available to our customers at Bud's Chrysler-Dodge-Jeep, Inc., is the only open-air pickup truck currently on the market. This truck has been designed to be strong and capable. It has best-in-class towing and payload, at 7,650 and 1600 pounds, respectively. This lets drivers haul their equipment wherever they need to go. The Gladiator comes with hardtop and soft top options. You can decide how you'd like to take your ride. Things can open up on top, the windshield can be folded down, and all four doors can even be taken off if you truly want to feel like you're in the outdoors. At the same time, the cabin is comfortable. It features advanced technology like the available 8.4 touchscreen and has multiple storage solutions.